On arrival you will be received by our representative at Veer Savarkar Airport, Port Blair & will be moved to Port Blair Hotel for check-in. Later you will visit Corbyns cove beach followed by a visit for Light & Sound Show at Cellular Jail, where the saga of Kalapani martyrs was written. Overnight at Port Blair. After breakfast, full-day excursion to Coral Island (North Bay) to see coral reefs, varieties of beautiful ornamental fish and other marine life. This is an ideal place for snorkelling as this sandy beach coupled with clear water creates a breath-taking spectacle. Please carry your drinking water & changing dress. After that proceed for Ross Island, the former residential and administrative island of the British during their rule of South East Asia, was nick named the Paris of the East. This island is an ideal destination for nature walk amidst sylvan surroundings with deers, peacocks, exotic birds, etc. This island was completely destroyed in an earthquake, now in ruins. Evening is free for leisure. Overnight stay at Port Blair. After breakfast check out from your Hotel & leave for this marvelous Island having plenty of marine life, Neil Island in Andaman is an ideal location for eco-tourism. Neil Island is triangularly shaped with lush green surroundings of paddy fields, banana plantations and tropical trees. Many natural beaches and attraction like Howra Bridge, a natural bridge formation makes this Island a much sought after picnic spot. The sandy beaches at Sitpur, Bharatpur and Lakshmanpur are very attractive for spending holidays. 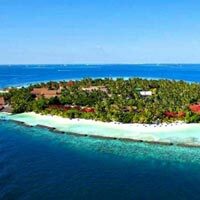 Tourists who like to spend vacations in an eco-friendly locale will find this Island an ideal spot. The breathtaking view of the sea and the lush greenery really is rejuvenating and enjoyable for enthusiastic travelers. Evening is free for leisure. Overnight stay at Neil Island. After breakfast Check-out from the hotel & transfer to the Neil Jetty to take a ferry to Havelock Island. On arrival at Jetty you will be transferred to you rpre-booked hotel. Enjoy the afternoon at the World Famous and Asia’s best beach "Radhanagar Beach" (Beach number 7), dont miss the mesmerizing Sunset at its shore. Evening is free for leisure. Overnight stay at Havelock. After Breakfast, you will be proceed for an excursion to Elephant Beach, by a dungi (small boat), you will be offered to snokell here. Later return to hotel by late afternoon. Overnight at Havelock. After breakfast check out from the hotel, transfer your luggage to Hotel cloak room. Day at leisure. In the afternoon, you will be proceed to take the jetty for onward ferry to Port Blair. On arrival at Port Blair Jetty, you will be transferred to your hotel. Evening free for leisure. Overnight stay at Port Blair. Early morning departure to Baratang. (dedicated vehicle for your group only). It holds the natures best treasures gifted to the Islands. The Road journey from Port Blair to Baratang is through a dense jungle, enroute you can see the oldest tribes of India, Jarawas, if you are lucky enough. Later visit Limestone caves and Mud volcano. Evening return back to Port Blair. Overnight stay at respective Hotel / Resort at Port Blair. After Breakfast, check-out from the Hotel & proceed to Sagarika (if time permits) to collect the Souvenir for your kiths and kins, before finally bidding adios to this memorable trip to this beautiful Island, with colorful memories of A Lifetime Trip.